Quarter four is not here to stay. So we are definitely making the best out of it! Here are our 3 great deals for the greatest season! 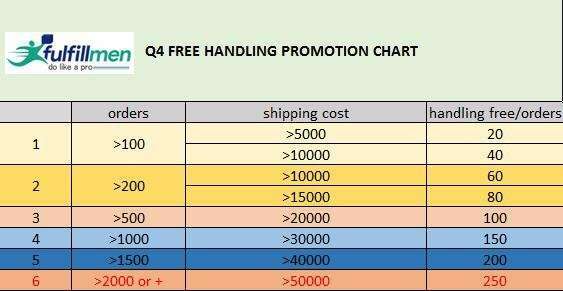 Level up your shipping orders and bag more free handling charges! Shipping cost is in CNY/RMB. Top Shippers Should be rewarded! Who says you do not deserve more? Every month, customers who shipped the most orders are identified and take pride with our attractive gifts! Wow! Deliveries are ramping! Your incentives Too! Refer a friend and get 2% recharge bonus in every shipping cost! Yes, seriously! How does it work? After your referrals activate their Fulfillmen account, you get 2% of their shipping cost for the whole month of November and December! Yay! All going to be your recharge bonus! Can you get these offers all at the same time? Of course! Why not! Get those orders shipped only with Fulfillmen! Not Signup Yet? Signup Today. Already using fulfillmen, talk to your Sales Manager Now! !